Ronnie Noize of DIY Marketing Center in Vancouver, Washington, joins me for today’s TradeshowGuy Monday Morning Coffee, and shares not only her top five marketing tips, but her top five “prosperity” tips as well. Good stuff! What motivates you? Recognition? Money? Promotions? Sometimes a motivation is pretty straight forward. In this week’s TradeshowGuy Monday Morning Coffee, I test drive a Tesla and talk about motivation. This week’s One Good Thing: Tesla! And this week’s ONE GOOD THING: Damian Lillard’s 4th NBA All-Star nod. NAB Show Cares is seen in the tradeshow industry as a groundbreaking program designed to assist exhibitors to have a better sense of exhibiting costs, and to keep those costs down. BJ Enright of Tradeshow Logic discusses the program, how it came about, its current status and what the future might hold. This week’s ONE GOOD THING: Old School! Online video is big and getting bigger. Even though you may recall the class action lawsuit against Facebook earlier this year for inflating video engagement numbers by as much as 900%, people still engage with online video BIG TIME. 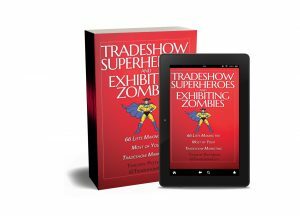 This episode of TradeshowGuy Monday Morning Coffee looks at online video and offers a handful of tips on how to engage with tradeshow visitors using video. This week’s ONE GOOD THING: Merry Christmas!